Not really cooking-related, but I thought I might ask here anyway. I got some signatures on an orange, and want to preserve them for as long as possible. Should I peel the orange? Freeze it? I heard something about moisture-controlled refrigeration? I'm willing to spend up to about $40 US, so of anyone has any ideas about this that'd be helpful. Thanks!!! Speaking of dehydration, it is possible to dry out a piece of orange peel. If you do it properly so it does not rot or get moldy, it will last for years, although it will gradually use its aroma. The problem is that it will shrink when dehydrating, resulting in a worse-looking surface and possibly distorting the signature. A largish section is also practically impossible to flatten, so you will have to live with a curled piece-of-sphere shape. The end product is very stiff and somewhat brittle, with irregular surface whose color is a darkened, somewhat dirty looking orange, not the bright hue of the fresh peel. 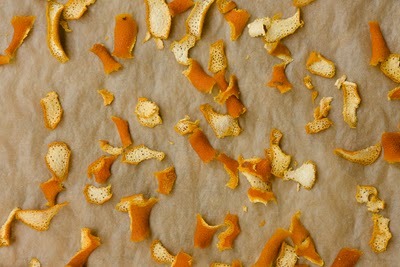 You can find instructions for drying orange peel for use in teas or as ground spice. The way we used to do it at my parent's home was to put a single layer of peel pieces on a high shelf and let them sit there for a few weeks. This will not work if your climate is humid, so you might prefer a method using a dehydrator or a low oven. This site has not only instructions, but also a good picture of the end result. They remove most of the pith (the white part) to prevent bitterness, but in your case, it is preferable to leave 3-4 mm to ensure structural integrity. You can leave all of it if it is a thin-peel variety, but remove some if it is very thick, because you risk rotting and bad texture and geometry. Whole fresh oranges, refrigerated, should last 1-2 months per Eat By Date. You can freeze orange peels (or any citrus) very successfully. When you have a sufficient quantity, you might choose to candy them, which should last at least several weeks if stored in a cool, dry environment, probably months if well dried as part of the candying process. You can also try freezing the juice, but the quality of fresh orange juice tends to be ephemeral. You may be better off enjoying it immediately. Not the answer you're looking for? Browse other questions tagged storage-method freezing fruit refrigerator oranges or ask your own question. How much juice can you get from an orange? Is there a quick, easy, mess-free way to peel an orange (or grapefruit)? Can a blood orange be half bloody? Can I peel a mandarin orange like the commercial canners do?